Italia Grapes is a vine from the crossbreed of Bicane and Moscato of Amburgo. It was established in 1911 but at first it was not considered a good vine. 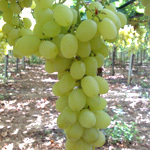 Only later, after verifying its behaviour in environments different from the original one, Italia grapes was successfully appreciated. 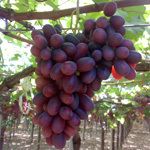 Nowadays this variety of grapes is one of the most loved in the world. Big bunch, 20 cm. long, cone-pyramid-shaped, loose, winged, with large and herby stalk. Very big, regular, egg-shaped grape; pruinose, thick, golden-yellow peel; succulent and juicy pulp, sweet taste. Production is rich and steady, maturity is late, generally between the second and the third decade of September. Vine of Italian origin, it comes, indeed, fromVelletri (Rome). Its name stems from Michele Palieri who manufactures it by interbreeding the varieties Alphonse Lavallée and Red Malaga. Good-looking, big, cylinder-pyramid-shaped bunch, winged loose, 600-800 gr average weight. 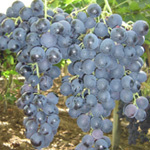 Big, oval grape; compact, pruinose, black-violet, medium-thick peel; crunchy, compact and juicy pulp; quite sweet taste. 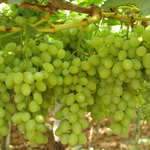 Production is good and steady, the grapes ripen between July and August. White vine, selected in Rumania at the Institute of Horticultural Researches in Dragasani. Genetically it comes from Cardinal and Afuz Ali (Regina). It is a very good vine above all for its earliness and its productivity. The bunch is big, pyramid-shaped and quite loose. The yellow grape is big and elliptic-shaped; the peel is little pruinose, medium-thick and green-yellow; the pulp is crunchy and at the same time juicy and quite sweet. It has a good resistance to carriage. Production of Vittoria Grapes is rich and its ripening is early, occurring between the end of July and the beginning of August. The RED GLOBE has been established by Olmo and Koyama at the University of California. It is the most widespread of the recently discovered varieties. Big bunch, 700-800 gr. average weight, (sometimes more than 1 kg),cone-,pyramid-shaped, winged with 1 or 2 wings, medium loose; red-violet and quite round-shaped grape, about 9-10 gr average weight. Production is steady and above all rich. The period of ripening and harvesting is between September and the end of December. 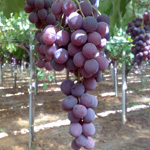 This grapes may be a good alternative in the final step of offer both for the period of ripening and for its good resistance to plant adversities and to carriage. 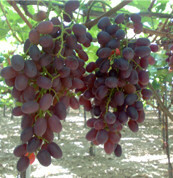 CRIMSON grapes are a late variety established by David Ramming and Ron Tarailo at he University of Fresno in California. This variety has been marketing since 1989. Middle big bunch, 500-600 gr average weight, pyramid-shaped, loose; long, dark red, compact and crunchy grape whose taste is excellent. Good and rich production. It should be necessary to decrease the weight of the harvesting (number of bunches per plant). The ripening is late and goes from September to November. 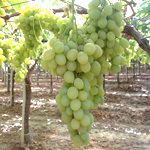 White, pipless it has the best characteristics among the pipless varieties: early, middle-compact and conic bunch; middle-big, yellow and egg-shaped grape; crunchy pulp, excellent organoleptic qualities. It has a good reaction (its ripening coming early) to covering techniques with plastic film. In protected cultivation it has increased the fertility of the buds ant the production. 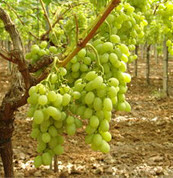 SUGRAONE is one of the best grapes as far as the quality and the production are concerned. It is early and excellent both for its organoleptic qualities and for its beauty: yellow, sweet, egg-shaped. 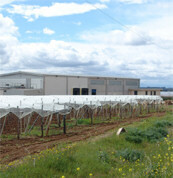 The harvesting is between July and August.